TV3 News shows latest poll results - Labour well up and National well down. There has been plenty running against the government but, to use a hackneyed phrase, "at the end of the day" many people have substantially more money in their pockets thanks to Working For Families. Labour bought the last election and are on their way to buying the next. Never mind any long term strategy for the country; global competitiveness; lifting productivity; breaking intergenerational dysfunctionality. It's all about mediocrity or worse. Yes. I am glum about it. Should have kept watching my John Farnham (John who?) concert instead of switching over to the news. It was going down very well with a glass of bubbly. Many people, including me, will be sympathetic to this protest against rapacious banks. Their fees are particularly burdensome on low income clients. But there is a certain irony in this protest. 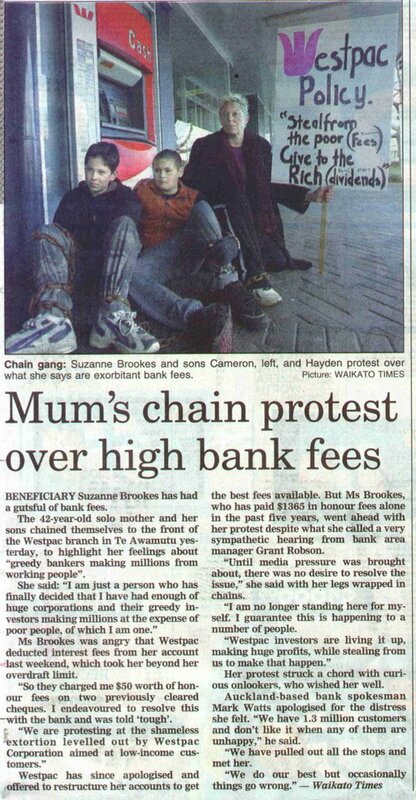 Ms Brookes is a beneficiary protesting on behalf of working people. Perhaps the best option for her to avoid incurring more dishonour fees would be to get a job. 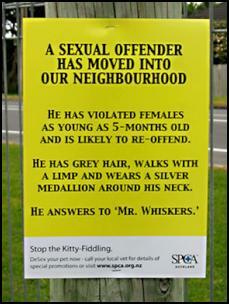 If there aren't any in Te Awamutu then she should move. 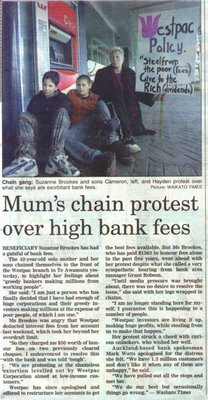 Otherwise she has nothing to look forward to but years ahead with the likes of WINZ and Westpac exerting more control over her life than she can. Spotted at Spare Room. A new name for Deborah Coddington's book? Not quite. But very effective advertising .....except....I do wonder.....given the way some people read blog entries and completely miss the sense or point, you'd have to worry about the safety of some old local joker who fits this description. British mothers are being offered tax credits and daycare places to help them hold down paid jobs but the majority do not like the policy, a survey among 1,736 mothers by First magazine shows. Six out of 10 thought the government "doesn't like traditional families" but favours single mothers and working parents. More than half also said they would send their child to a private school if they could afford it, and two-thirds thought grammar schools -- abolished in the 1970s -- were a good idea. Among those surveyed, whose average age was 37, about a third worked full-time and a third part-time. Three-quarters of those working said they would reduce their working hours if they could, and nine out of 10 said that if a mother was married and wanted to stay at home, her tax allowance should be added to her husband's, allowing more women the option to be stay-at-home mothers. They blamed the destruction of family life on "families not eating together" (72 per cent) mostly due to both parents having to work, "video games consoles" (46 per cent), "working mothers" (41 per cent), and "women becoming breadwinners" (23 per cent). The main reason mothers of young children returned to work was to meet basic needs (60 per cent). But with many outside influences, mothers said they were struggling to discipline their children - eight out of ten did not think their children were well disciplined either at home or school and a third admitted that their children swore at them. I wonder if it has crossed the minds of many women that the cost of the welfare state, the biggest gobbler of their's and their partners taxes, has reduced their choices? Many appear to feel unable to control their family life due to financial pressures. "We'd certainly prefer to have public education funded by the Government," said Parents Victoria president Elaine Crowle. "We'd hate to have a McDonald's-sponsored school or something." Interesting to read National Leader Don Brash stepping into the welfare debate. The headline read, Brash won't pussyfoot on welfare. Part of my prediction was right. He was trouble for English. And I still maintain given the chance he won't mess about with welfare. Let's just hope his colleagues don't wimp out on him. "Drug babies on the rise"
This report from the Australian probably has significance for New Zealand. Cannabis smoking during pregnancy is a more dire problem in Australia than previously thought, and the effect on babies is severe, a world-first study has found. The problem is compounded by the fact that 90 per cent of drug-addicted expectant mothers smoke cigarettes, raising further the risk to their babies. An Early Start evaluation programme from Christchurch which looked at those families most in need of support services found that 63 percent of mothers smoked during pregnancy and one in six used cannabis. 90 percent were on welfare. David Benson-Pope says, "Smart jobs, not smart cards," and promises to release "milestone" figures tomorrow showing what a great job Labour are doing getting beneficiaries into work. These will be the June 2006 quarter benefit figures. There may be a substantial drop in DPB numbers because single parents who were working part-time but still getting a partial benefit will have moved onto the Working For families In Work payment. Smoke and mirrors really. The In Work payment comes from the IRD whereas the partial DPB came from WINZ. "When a client exits benefit, Work and Income does not record whether that person went on to receive an In-Work payment. I am also advised that when a person applies for the In-Work payment, Inland revenue does not record whether the person has just left benefit." So if the government is trumpeting a drop in DPB numbers numbers tomorrow bear this in mind. Apart from which, National's proposal about smart cards was aimed at a completely different group of beneficiaries from those amenable to working. People on the DPB trying to find a balance or transition between child-minding and work aren't the problem. 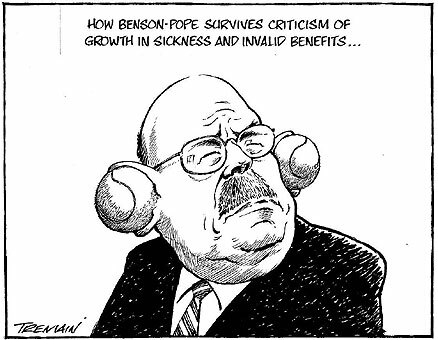 Benson-Pope is simply trying to take the heat off an underclass festering away under his governance. It's disgusting. The economy: The Labour-Progressive-Green (LPG) bloc won 47.6% (41.1% + 5.3% + 1.2%) of votes cast last September midway through a six-month period of zero economic growth. The Nat-ACT-United-NZF (NAUN) alternative got 49% (39.1% + 1.5% + 2.7% + 5.7%), but National still managed to end up in Opposition. The economy will be much stronger in 2008 than it was during the zero growth second-half of 2005. In-fighting on the Right: United and NZF promised to support the party with the most seats to form a government last year. ACT's capture of two seats was the most critical factor in last September's government-formation outcome. Had National kept Epsom and those two ACT seats instead been National seats, then it would have been 50-50 seats a piece between National and Labour and there is no question that that would have delivered a National-United-NZ First government supported on confidence by the Maori Party. Rodney was the Left's saviour last September and on-going in-fighting across NAUF will be even more intense in 2008. Stuff reports in March there was a record number of child abuse and neglect notifications to CYF. This marries up with the CYF statement of intent predictions posted earlier. If CYF know how many cases there will be they know what is driving them. The Government's child-protection agency is struggling to cope with its growing caseload, leaving even children in critical situations languishing on its books, new figures show. Welfare groups say it is time Child, Youth and Family (CYF) admitted it could not handle its workload and contracted out more cases to qualified or experienced community groups. In March, CYF received a record number of calls, with almost 6000 notifications from police or the community about possible child abuse or neglect. And just stop for a moment. Think about this. 73,000+ cases per year represents 13 percent of under ten-year-olds. Of course some cases may represent the same child, some more than one child and some, children over ten, but this highly unscientific calculation serves to create some tangible idea of the scale of notifications. Here's a pearl of wisdom from Minister for Auckland, Judith Tizard. In her usual spot with Tau Henare on NewstalkZB this morning she was opposing any move to control how beneficiaries spend their money. She said this, "In order to learn the value of money they need to learn the value of money." No Judith. In order to learn the value of money people need to earn it. What do we think about this proposal from National? National is investigating smart cards to stop beneficiaries spending welfare payments on booze, drugs or gambling. The proposal involves paying about one-third of benefits for seriously at-risk families directly to supermarkets. The money could be accessed only with smart cards similar to existing loyalty cards, which would block the purchase of selected items, National welfare spokeswoman Judith Collins said. "It wouldn't have to be everybody who's a beneficiary, but for those who are clearly not looking after their kids in terms of being able to get them fed before they go to school, we should be looking at it." Ummm. How would I rip this off? I know. I'll swap my food purchases with a mate for booze and ciggies. She buys $30 worth of booze and ciggies. I buy $40 worth of food. We swap. She's got more food and I've still got my "luxuries". The kids are still going hungry but I don't care. And I'm still getting two-thirds of the cash I was so I can still play the pokies. In fact I'll need to spend more on the pokies trying to recoup what WINZ aren't giving me. Steve Maharey appeared on Close Up on Monday evening. Paul Henry discussed the issue of dyslexic children with the Minister of Education. You can see the interview here. Yesterday, it triggered a storm of calls to talkback which persisted from 8.30 to midday. People were very angry with Mr Maharey who they felt was "arrogant" and "out of touch". He was maintaining support for dyslexic children was quite adequate whereas parents calling Justin du Fresne's show described quite a different situation. At about 3 minutes to twelve Mr Maharey rang in. What he said went something like, You know I come from an academic background, my trade is as a sociologist. I want people to be reassured that I might be a new Minister for Education but I am very familiar with the subject of dyslexia. And on it went in this vein. The impression created was Mr Maharey's ego had been dented and he had rung in to defend it. Given he had barely a couple of minutes airtime that is what was most important. What he should have done is acknowledge the callers concerns and the lack of time to properly address them. Then he should have asked the host if he could come on air the next day, possibly to do an extended session during which people could ring in and speak with him. As it was he only made a bad situation worse. * "When you know you will pass anyway, why study? And after you have 80 credits there is no motivation to do better." * "No need to try hard, no motivation to work hard. Can slack off for most of the year and still pass." * "Higher achievers get the same amount of credits as the basic achievers - no incentive to gain higher marks." * "I can look as good as someone who gets 100 per cent as long as I pass." * "It encourages people to be average." With two children who will go through this system this report is a real worry. One of them thrives on recognition - the other is more of a cruiser. It seems ridiculous that the NCEA system offers me more confidence that the second one will be all right but the first could struggle to stay motivated. I'd hazard a guess that some welfare dependants think money is merely something the government prints at will. There is no understanding that the money they receive is the product of somebody else's efforts. Because they don't understand this, they rationally resent their relatively small share. Those who do understand the source of their income have an attitude that the productive person's money isn't rightfully theirs because they got it by exploiting others and they have too much of it anyway. There is no end of people who see themselves as victims of some sort of injustice or unfair treatment, be it of sexism, ageism, racism, capitalism or colonisation. These people, with their inevitable collectivist mentality, demand recompense from all of society. Either thought process leads to the conclusion that the world owes them a living, and any avenue by which they subsequently obtain money is, to their mind, justifiable. 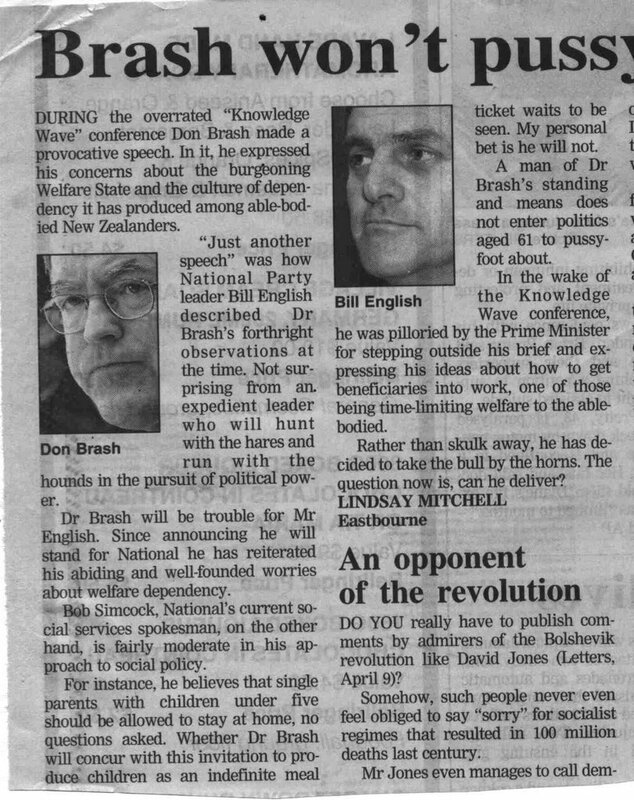 A self-explanatory letter sent from a good friend of mine to the DomPost. I reproduce it here because there is no guarantee the DomPost will publish what contains some unpalatable truths. The Kahui tragedy led to two points of view in the Dompost: the 29/6 editorial "Blame welfare, not colonialism" and Chris Trotter's column the next day: "Playing the Blame Game"
When I worked as a Plunketnurse from 1975 -1985, the corrosive effects of welfarism were blindingly obvious and predictable even then. Poor Pakeha as well as poor Maori women were living on the dole as single mums and continued to give birth to fatherless children. The dole was their meal ticket. Just how to end or even change a "lifestyle" that has become so ingrained over several generations is far from clear to me. Reporting on the Kahui case Radio New Zealand says , Twenty detectives are working on the double homicide inquiry. Hamilton's detectives are being side-tracked from serious crime as the thin blue line is stretched ever further....At least 24 cases are sitting unallocated, some dealing with the sexual violation of children. The Kahui's refusal to co-operate is surely demanding greater resources which are desperately needed elsewhere. They are the pebble thrown in a pond from which many ripples continue to grow. While a "blitz" on the dole is welcome, even more urgent is a blitz on the DPB, according to Lindsay Mitchell, welfare commentator. Appearing on Breakfast TV yesterday Mitchell said, "We must stop paying babies to have babies." "Obviously the Prime Minister wasn't listening. According to the DomPost she has called for a blitz on the dole and identification of families that have been on welfare for three or four generations. While those on the dole may be fathering the babies it's the women on the DPB who are having them. They control that eventuality and they won't rely on a man's income if they don't have to. It is the DPB driving intergenerational dependency - not the dole." "But why has it taken so long for the PM to make this call, as incomplete as it is? In 2004, when the dole 'no-go' zones were introduced, I asked the Prime Minister why they didn't apply to people on the DPB. She admitted then there are families in Northland and the East Coast where drug, alcohol, violence and crime problems were rife and some children hadn't seen their grandparents go to work, let alone their parents." "In 2003 New Zealand data was analysed by the University of Auckland in an effort to define the degree of intergenerational benefit dependency. They found a correlation co-efficient of between one and two thirds. The 'results also suggested that transmission of welfare dependency from one generation to the next may be somewhat stronger among females and Maori youth.' "
"Just last year an evaluation of the Early Start programme in Christchurch, which looked at families most in need of support services found that 64 percent were single parent families. Of those over half of the mothers had been raised in single parent families. 90 percent of the families were on welfare." "This problem has been staring us in the face for decades. The Prime Minister needs to get over her feminist inclinations and call for a blitz on both the dole and the DPB or is it only men who are to be scrutinised?" The Government's having a crack down on benefit abuse by entire families in the wake of the Kahui case. During the course of the inquiry it was revealed that multiple members of the murdered twins' family are on benefits. Prime Minister Helen Clark says the Government is looking at whether there are clusters of households like the Kahui family, which can be investigated to see if their benefits are being paid properly. She says it is a problem which involves an extremely small proportion of beneficiaries who get in a cycle of dependency and do not work. When people give one address but are transient between others, when relationships aren't disclosed, when true living costs are not declared, when children get passed between families, how does she know that the problem involves an extremely small percentage of beneficiaries? There are a couple of interesting confirmations in this article. In the Waikato, 41 of every 1000 15-19 year-olds had babies, compared with the national average of 31. The poorest women were – 10 times more likely to give birth than teenagers in the most well off situations. They will all be going on welfare - long term. Dr Craig said the birth rates differed significantly between races. Nationally, Maori were nearly five times more likely to have teenage births than Europeans, while Pacific Islanders were three times as likely. None of this augers well at all. But Aunty Tariana will be pleased. Is the Ministry of Social Development not the most perverse department? Here are predictions from the CYF division Statement of Intent. They include a 38 percent increase in child neglect and abuse notifications and a 29 percent increase in referrals from the Police to CYF. This division is frantically try to get on top of their workload while another division, WINZ, are busy handing out benefits to the people who create all of this dysfunction. Go Figure. I'm on Breakfast TV One at 7.10am tomorrow discussing welfare reform.